Brand safety in an always on world. A look back at Marketing Excellence Awards. Best eCommerce brands in SEA. Meeting unique creative needs with HK’s different sized agencies. Tech advancements transforming Hong Kong retail. Top five HK video ads from the past year. An online toolset revolutionising wedding planning. How Mattel continues to empower women. Finding the balance in the gender debate. Marketing to the new-age female consumer. 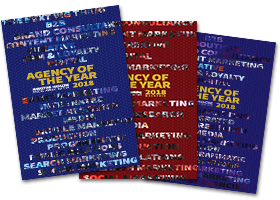 Celebrating and honouring the region’s top agencies and campaigns.